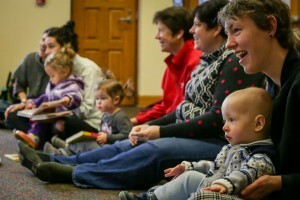 Come out of the weather and attend a storytime this winter. Meet people in your community. Storytime is a great place to talk to other caregivers and make friends. Develop your child’s pre-literacy skills. The songs, rhymes, books and activities we do in storytime help children learn skills they will need in order to read and write later on. They’re convenient. We hold storytimes on a variety of days and times, including evenings and Saturdays. They’re for all ages. 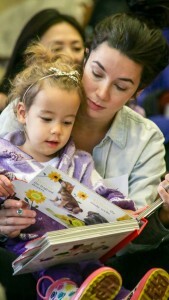 We have storytimes just for babies, toddlers and preschoolers, and many for the whole family. It’s free! All library programs are offered at no cost. It’s FUN! 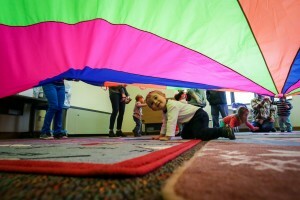 Storytimes include bubbles, singing, art activities, and sometimes even the parachute! This list below is sorted by age. To view storytimes at your nearest branch click on the name of the branch. Join us for one-on-one lap time with bouncing rhymes, songs, and group play. For babies birth to two years (with exception to the Wheelock Branch session). Movement, music, stories and activities for toddlers (18 - 36 months) with a participating caregiver. Stories, music, felt stories, ukulele songs and more for three to five year olds. Kids of all ages can wear their pajamas and join us for stories, songs and more. Recommended for children ages two to five years old. Have fun reading books, enjoy rhymes, songs and fingerplays, and then get out the mega blocks for play time. Join us for stories, music, activities and play for all ages.